Magnetospheric Research satellite for NASA SwRI, USA. Launched 2015. Status: Operational 2015. First Launch: 2015-03-13. Last Launch: 2015-03-13. Number: 4 . Gross mass: 1,250 kg (2,750 lb). SMM American solar satellite. The Solar Maximum Mission (SMM) was intended primarily to study solar flares and related phenomena. Solar observatory satellite built by Fairchild for NASA, USA. Launched 1980. Used the MMS bus. Landsat 4-5 American earth land resources satellite. Earth Observing satellite built by Fairchild for NASA, NOAA, USA. Launched 1982 - 1984. Used the MMS bus. EUVE American ultraviolet astronomy satellite. 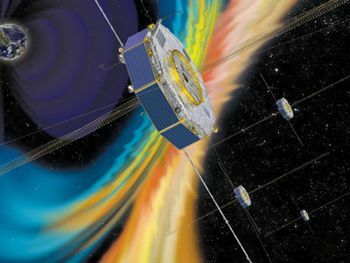 The EUVE Extreme Ultra-Violet Explorer mission mapped space in the 70- to 760-angstrom portion of the spectrum and conducted detailed ultraviolet examinations of selected celestial targets. Astronomy, extreme UV satellite built by Fairchild (Bus), NASA Goddard Space Flight Center (Payload) for NASA, USA. Launched 1992. Used the MMS with exchangeable payload module bus. Topex/Poseidon American earth sea satellite. TOPEX/Poseidon was a co-operative mission between the United States and France designed to provide high-accuracy global sea level measurements. Earth Observing satellite built by Fairchild for NASA, CNES, France. Launched 1992. Used the MMS bus. Family: Science. Country: USA. Launch Vehicles: Atlas V, Atlas V 421. Launch Sites: Cape Canaveral LC41. Bibliography: 11446, 12845. 1989 November 23 - . Solar Maximum ends operating life. - . Nation: USA. Spacecraft Bus: MMS. Spacecraft: SMM. SMM finished collected data . It re-entered on December 2, 1989..
UARS - . Payload: Discovery F13 / UARS. Mass: 6,795 kg (14,980 lb). Nation: USA. Agency: NASA Greenbelt. Class: Earth. Type: Ionosphere satellite. Spacecraft Bus: MMS. Spacecraft: UARS. Decay Date: 2011-09-24 . USAF Sat Cat: 21701 . COSPAR: 1991-063B. Apogee: 582 km (361 mi). Perigee: 574 km (356 mi). Inclination: 57.00 deg. Period: 96.20 min. Upper Atmospheric Research Satellite; deployed from STS-48 on 15 Sepetember 1991. It studied the depletion of the ozone layer, confirming that CFCs cause the `ozone hole', and improved models of upper atmosphere chemistry, including studies of methane in the Antarctic, sulphur dioxide from volcanoes, and global wind measurements. Some media hysteria surrounded its reentry on 24 September 2011, but it apparently came down unobserved in the Pacific Ocean east of Hawaii. 1992 June 7 - . 16:40 GMT - . Launch Site: Cape Canaveral. Launch Complex: Cape Canaveral LC17A. LV Family: Thor. Launch Vehicle: Delta 6920-10. EUVE - . Mass: 3,275 kg (7,220 lb). Nation: USA. Agency: NASA Greenbelt. Class: Astronomy. Type: X-ray astronomy satellite. Spacecraft Bus: MMS. Spacecraft: EUVE. Decay Date: 2002-01-31 . USAF Sat Cat: 21987 . COSPAR: 1992-031A. Apogee: 524 km (325 mi). Perigee: 510 km (310 mi). Inclination: 28.40 deg. Period: 95.00 min. Extreme Ultra-Violet Explorer; mapped galactic EUV sources. The Extreme Ultraviolet Explorer was switched off on February 2, 2001. NASA decided to terminate funding for the mission, even though the spacecraft was still operating well. The sky survey was completed in January 1993 and after that the EUVE was used by guest astronomers for observations of specific targets. The final observations were made on January 26, 2001. After end-of-life tests of the never-used backup high voltage supplies and checking the remaining battery capacity, EUVE was stabilized pointing away from the Sun and sent into safehold at 2359 GMT on January 31. The transmitters were commanded off on February 2. 1992 August 10 - . 23:08 GMT - . Launch Site: Kourou. Launch Complex: Kourou ELA2. LV Family: Ariane. Launch Vehicle: Ariane 42P. Topex/Poseidon - . Mass: 2,402 kg (5,295 lb). Nation: France. Agency: CNES, JPL. Class: Earth. Type: Sea satellite. Spacecraft Bus: MMS. Spacecraft: Topex/Poseidon. USAF Sat Cat: 22076 . COSPAR: 1992-052A. Apogee: 1,344 km (835 mi). Perigee: 1,331 km (827 mi). Inclination: 66.00 deg. Period: 112.40 min. Ocean sensing, mapping. Spacecraft engaged in research and exploration of the upper atmosphere or outer space (US Cat B)..
EUVE completes initial "all-sky" survey - . Nation: USA. Spacecraft Bus: MMS. Spacecraft: EUVE. A Guest Observer program was initiated in February, 1993..